If you have made an investment in river rocks, it is truly commendable! It not only shows how classy your taste is, but it also reflects your unique style of living life. Having a garden is a pleasure in itself and if you plan to incorporate rocks in your home garden, then you are not far from some exclusive visual treats ahead. In the very first place, it is important to let you know that having river rocks is the other name for getting rid of pest problems. River rocks are known for holding heat, not water. But these also act as mulch and hold water in the soil. River rocks can make the temperature moderate since rocks can hold heat. They can be placed in areas where you do not want an excessive growth of grass. These rocks are also ideal for places in between your deck and lawn. The slanted layers of black and white river rocks make a truly consistent arrangement for keeping the run-off water away from gathering around the drainage pipes and down spouts. Your concept of having river rocks in your garden would be truly rewarding if you try to grow some hardy plants in the areas covered by the rocks. It is during springtime when river rocks actually become more active in warming the soil, which results in the faster growth of larger pants in the landscape setting of your house. Ornamental grasses look even more attractive with river rocks mulch. You could try the following spots for using river rocks in landscaping, namely paths, columns, walls, patio floors, accent pieces and foundations. Virtually there can be endless ways of using river rocks. With a natural looking setup in the yard, using river rocks could be ideal. You can hire landscaping designers who can arrange the rocks in neat, straight files or they can embed a garden bed with zigzag pattern of rocks. When you use accent rocks, the look and feel of every design can transform radically. 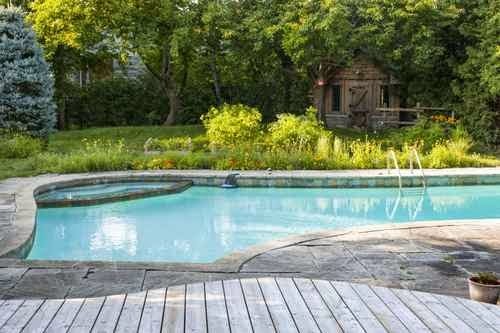 How about trying to put some river rocks around your swimming pool or the pond in your backyard as a natural border, which would be very unique? You can have a wide array of accent rocks to offer you design options and embellish your yard in interesting ways. There are many more ways of using river rocks. 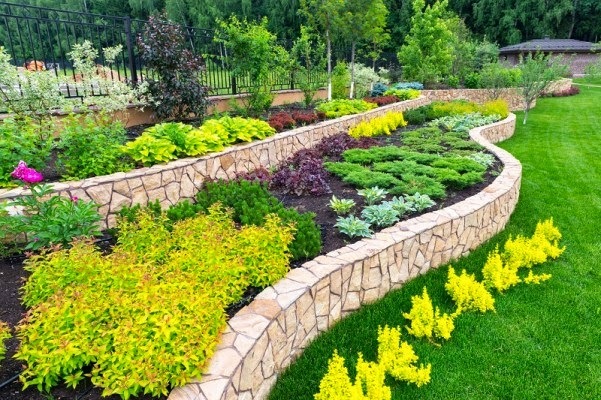 Have you thought of using river rocks for building a retaining wall? Such a wall would not just add an additional security to your property but it will also facilitate you by offering more benefits of adding that extra bit of beauty to your house, which everyone is bound to appreciate. If there are accent areas that lack borders, you can use river rocks for this purpose. You could even use the rocks to make a garden. 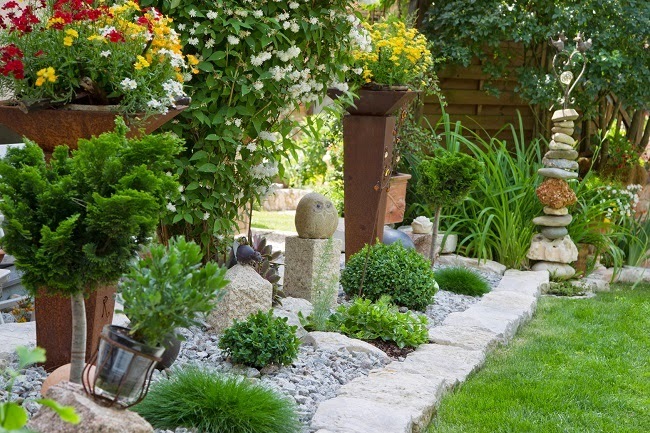 To make you garden look even more stunning and unique, you can use river rocks around your flowerbeds. Your house will undoubtedly look very different and special. The natural essence of the setting would add to the value of your property both in terms of appearance and prestige. River rocks can be used creatively in rock landscaping. 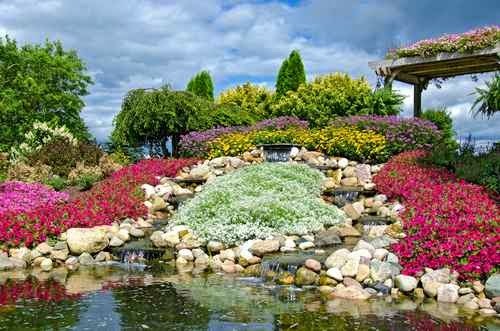 Moreover when you use the river rocks in the flowerbeds, not only do you augment the beauty of your property but also successfully keep the weeds at bay. With this natural look, your yard can become a lot more appealing! Barring the plants that are heat-sensitive, you can grow the rest in river rocks. Foliage plants like phormium and yucca grow extremely well in river rocks. Do you want to know more about River Rocks? Let’s go to the details and grab the more details about this.